Dina Asher-Smith is still hopeful of making the World Athletics championships next month despite finishing sixth in the 100m at the British trials. Dina Asher-Smith declared herself still on course for next month's World Championships in London despite finishing in a disappointing sixth place in the women's 100 metres final at the British trials in Birmingham. Competing for the first time since she fractured her foot in a training ground accident in February, the 21-year-old clocked 11.53 seconds, well down on top two Asha Philip and Daryll Neita, who have qualified outright. 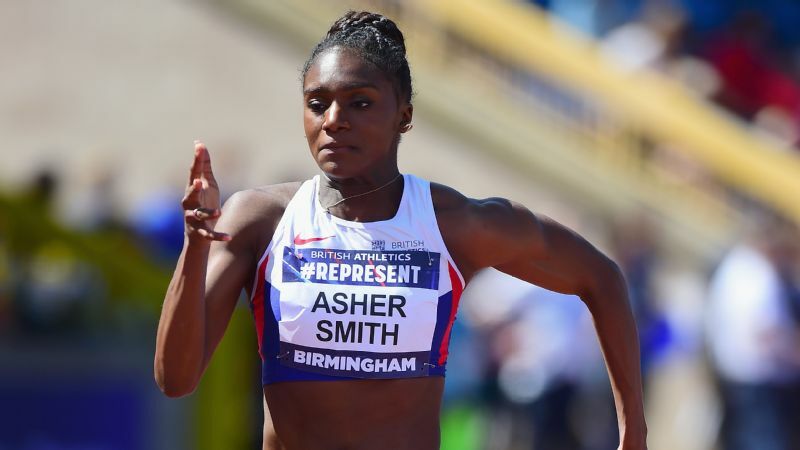 Asher-Smith will now focus on convincing the selectors that she deserves a place in the 200m squad for London, her favoured event and one in which, as the reigning European champion, she does not necessarily need to hit the 23.10 secs qualifying mark. A tearful Asher-Smith said: "I have been training for three weeks so I am so happy -- everyone said I was not going to be able to run at all in 2017 but I thought, I just can't let that happen because it is a World Championships. "The London dream is definitely back alive -- I was so scared as you can imagine. For me it would be so heartbreaking as it is something I have really worked for -- I could not let a home World Championships pass and not be on the team. "I am disappointed not to have done better but at the same time this is not my favourite event, so I am just trying to get some races in me before [next week's Anniversary Games] and hopefully that will be good enough to earn me selection." Asher-Smith confirmed she will not run in the women's 200m at the trials on Sunday, but will instead gamble that she can convince the selectors that past experience deems her worthy of an individual place over the distance. Men's 100m favourite Chijindu Ujah broke the 10-second barrier in his semi-final before withdrawing from the final with a minor injury which is not expected to affect his seemingly inevitable selection for the Worlds. In the absence of Ujah, who had earlier clocked 9.98, the final was won by Reece Pescod, who booked his place in the World Championship team along with second-placed James Dasaolu after recording qualifying times of 10.09 and 10.11 respectively. But former Olympic champion Christine Ohuruogu looks likely to miss out on a place in London after failing to qualify for the women's 400m final. The 33-year-old recorded only the 13th fastest time of the heats and her hopes are now likely to rest on winning a place in the 4x400m relay squad. Ohuruogu had reversed an earlier retirement decision after last year's Rio Olympics, but indicated she would cut down her training regime as she targeted a place in London. Her disappointment comes two weeks after the news that she is set to become Britain's most decorated world medallist due to Russian athlete Anastasiya Kapachinskaya failing a drugs test. The announcement is likely to result in Ohuruogu being given relay bronze for both the 2009 and 2011 World Championships, enabling her to move two clear of Mo Farah with eight career world medals to her name.